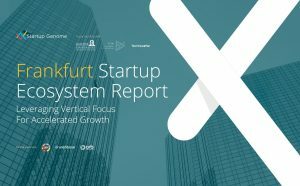 Frankfurt has the highest concentration (tied with another ecosystem) of startups in a given sub-sector (Fintech) globally across the nearly 100 ecosystems studied. In addition, more than 50% of local VC investment went into its Fintech startups between 2012 and 2017. Three most important sub-sectors: FinTech; AI, Big Data and Analytics; Cybersecurity. Frankfurt ranked in the global top 5 when it comes to global connections happening locally, which means founders from other top-performing ecosystems come to Frankfurt to network with its founders.